The U.S. tried to foster BIM with NBIMS, also others in the world tried PAS this and PAS that, and ISO this and ISO that… the issue remains that standards can’t replace knowledge and competency. At the end of there day BIM represents nothing new relative to the efficient life-cycle management of the built environment. Sure, software firms, and folks that love 3D and make a living from it will tell you otherwise, but the simple truth is that BIM, as we now know it, can not and will not survive. The fact that BIM is a failure is sad because the world desperately needs to get a grip on how to manage its limited economic and environment resources and built structures are significant in that process. Furthermore, there are critical life-safety and security issues associated with our crumbling and mismanaged physical infrastructure. The primary issue is that many facility management and AEC professionals confused 3D visualization with asset life-cycle management. While 3D visualization is nice tool, is is just that, an individual component in the toolbox. It’s not even the most important tool. Large, multi-site, multi-national real property portfolios can be efficiently managed WITHOUT 3D visualization and BIM software as now available. Thus the pressure by countries, such as the UK to use BIM is misdirected. Any government regulation should be directly solely at Owners. More specifically, asset life-cycle management practices and collaborative construction delivery methods (integrated project delivery – IPD, job order contracting – JOC) should be mandated. This includes a formalized set up key performance indicators (KPIs), robust lean best management practices, and ongoing education and training. The methods to eliminate the rampant environment and economic waste endemic to the Architecture, Engineering, Construction, Operations, and Owner sectors has been available for decades, we simply don’t require Owners to do their jobs. Owners must be required to develop technical and business competencies with respect to asset life-cycle modeling and total cost of ownership, and be able to LEAD collaborative teams of service providers. Until this happens…. nothing will change, it is indeed as simple as that. © 2013 Ralph G. Kreider) that defined BIM uses and looked a actual project, we now have a much better picture of the “BIM State of the Union”. BIM is the life-cycle management of the built environment. 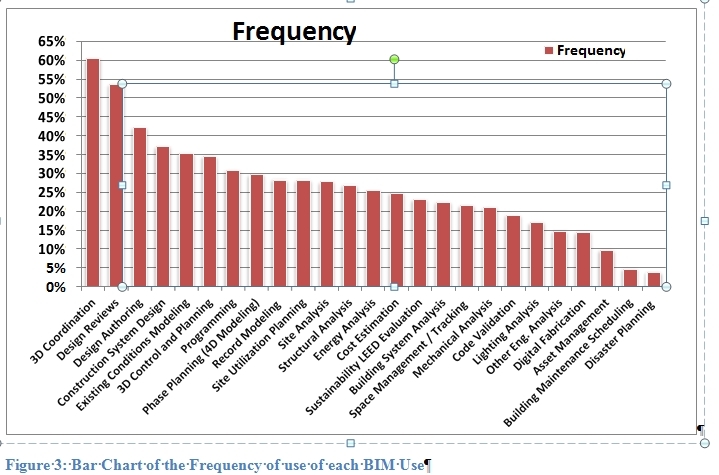 Note how many respondents were using BIM for asset management… less than 10%. Until there is a robust focus upon the business process competencies required for life-cycle management of the built environment, and an associated ontology… little substantial progress can be made. So…. how does one begin to develop an ontology for BIM / Life-cycle management of the built environment? Well.. help me draw on a napkin? My BIM is Your BIM – Owners, Contractors, AEs, Building Users, Oversight Groups, Business Product Manufacturers, Community …. BIM is the life-cycle management of the built environment supported by digital technology. It is first and foremost the process of developing and leveraging actionable information (standardized, accurate, transparent) to efficiently manage the total cost of ownership and functional requirements of a built asset (building, infrastructure, etc.). BIM is NOT rocket science, it is not 3D pretty pictures, it is not all about technology. BIM first and foremost about early and ongoing collaboration, continuous improvement, and robust life-cycle management process supported with integrated technology and standardized information. Collaboration construction delivery methods such as Integrated Project Delivery for major new construction, and Job Order Contracting for renovation, repair, sustainability, and minor new construction are important, if not requisite, components of BIM. Equally important from an Owners perspective is the integration of multiple competencies, business processes, and technologies such as capital planning and management (CPMS) for capital reinvestment strategy, computerized maintenance management (CMMS) for “movable” asset inventory and routine/preventative maintenance, computer aided facility management (CAFM) for space mangement, building automation (BAS) for security/energy, and geographical information (GIS) for rapid locationing. Forget “integrated workplace management systems” (IWMS), they are attempts at BIM by single vendors. As one might expect, no single company can be expected to be competent across all knowledge domains and practices. Through the use of standardized informatoin exchanges, “best in class” technologies will finally be easily integrated as “plug-ins” to a users cloud-based technology platform. The day is here…. you can wake up or go back to bed…your choice. 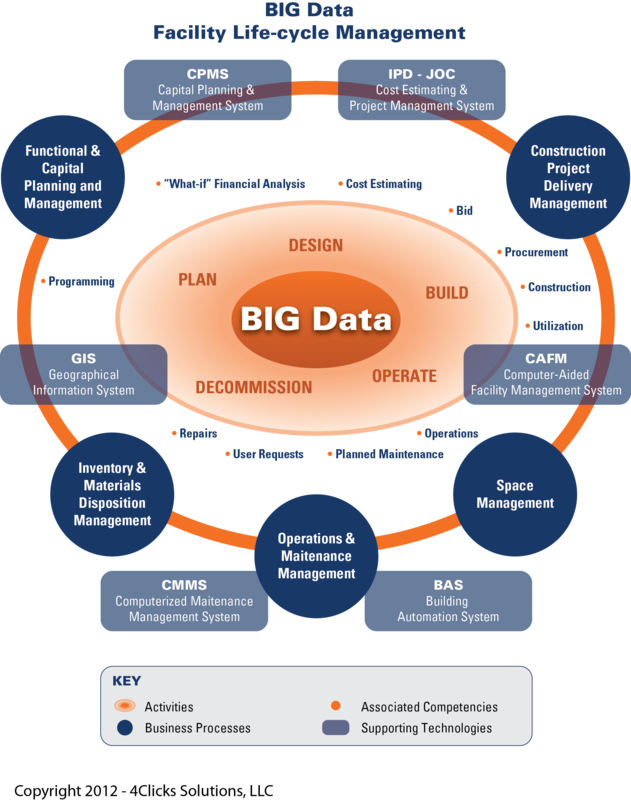 COBie – Construction Operations Building Information Exchange – Organisation and structuring of information. This is information that is essential not only to the design and construction of a built asset, but also its operation and maintenance. Currently focused upon delivering FM information at handover, but rapidly expanding. OMNICLASS – A standardized information classification system for the built environment. An integration and expansion of UNIFORMAT, MASTERFORMAT, etc.to incorporate all buildings spaces, equipment, processes, technologies, etc. Standard Cost Data – Most notable example is RSMeans. Well researched cost data (material, equipment, labor) and associate construction / facility management sq. ft., assembly, and unit cost information and associated task listings. Critical for use to “benchmark” and/or “confirm” local processes/projects. Also standardized using Masterformat. Job Order Contracting – Collaborative construction delivery method using a standardized unit price book (UPB) based upon RSMeans and/or customized cost information. Cost are best update annually or quarterly. Process has been embedded within software to enable cost effective and consistent deployment. Reducing procurement costs, mitigates change orders, and virtually eliminates legal disputes. Integrated Project Delivery – Similar to JOC, however best suited for major new construction only. The OmniClass Construction Classification System (known as OmniClass™ or OCCS) is a classification system for the construction industry. 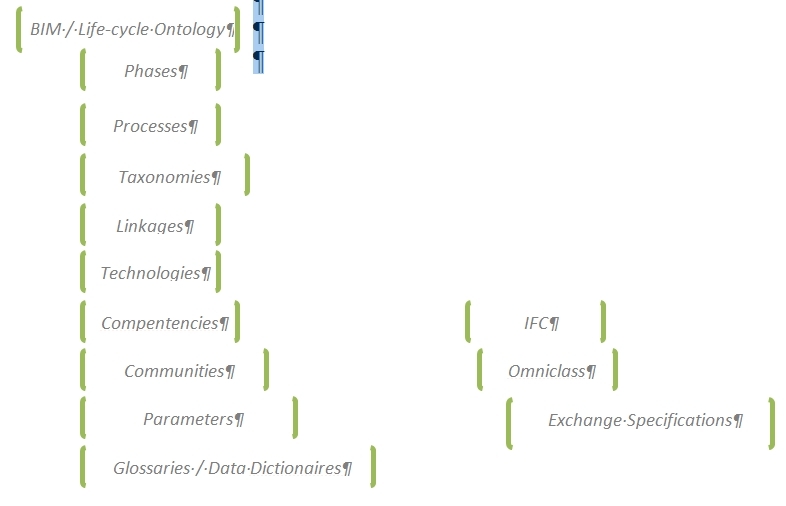 OmniClass is useful for many applications, from organizing library materials, product literature, and project information, to providing a classification structure for electronic databases. It incorporates other extant systems currently in use as the basis of many of its Tables – MasterFormat™ for work results, UniFormat for elements, and EPIC (Electronic Product Information Cooperation) for structuring products. Much has been said about BIM, and many misunderstand its core definition and purpose. BIM is the process of efficent life-cycle management of facilties and associated infrastructure, supported by digital technologies. 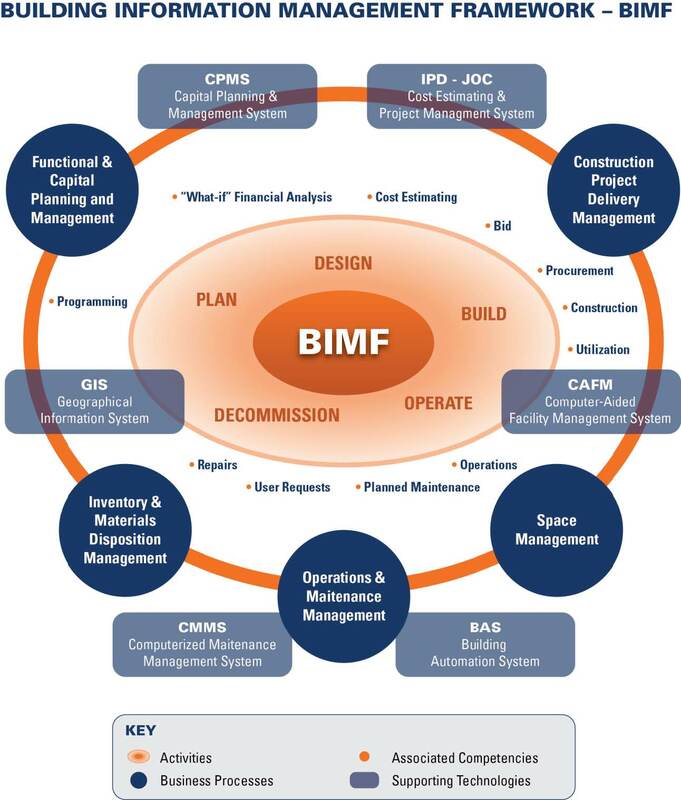 BIM is not IWMS, CPMS, CMMS, CAFM, BAS, GIS ….. , but the integration of these and other core knowledge domains within a collaborative enviroment… with Owners, Contractors, AEs, facility/infrastructure users, service providers, and oversight groups… sharing information via open, comment defintions, taxonomies, benchmarks, practices and standards. Technology now allows for the relatively simple task of integrating multiple technologies and knowlege domains and enabling accurate, secure, and rapid access to detailed informations and decision support systems. However, the REAL ISSUE is that the AEC / AECOM sector must change its “ad hoc” and traditionally unproductive ways of doing business.